I know before i post a recipe, i owe an explanation about my disappearance…There were many reasons that kept me away from blog world. I just did a detailed post here hence won’t bore you guys by repeating it here. Before i start spamming your in boxes, let me get this recipe out of the way!!! After mastering it, i wanted to learn Paneer Butter masala. 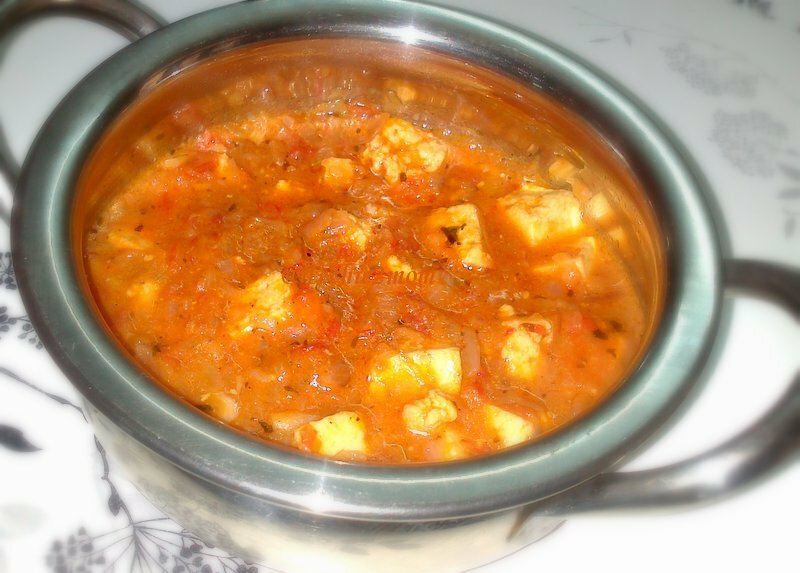 I have been making a simple paneer curry with gravy of onion and tomatoes, while we liked it, it didn’t taste like the ones we find in restaurants. In my quest of butter paneer recipe i referred to the Neeta Mehta book that i had, it suggested adding ketchup. Later i saw the recipe on Nag’s edible garden too and she too has almost similar recipe. Adding ketchup made all the difference for my curry. Over the time i have realized that to make the perfect restaurant style paneer butter masala, you have to add kasoori methi, tomato ketchup and cream!! This combo is killer!!! The pics have been lying in my computer since February 17th, almost 5 months!! Considering how delicious it is and how often i make and how quick it is and how it has proved to be life saver, i am surprised at how and why i haven’t already shared it with you guys?!?! Better late than never, they say, so here it is..
1) Take onions, tomatoes, cashew nuts and cream in a mixer jar and mix nicely to get smooth paste. 2) In a kadai (wok) take oil and add the prepared smooth paste. Also add the green chili and ginger paste and crushed garlic. 3) Cook on medium flame till you see oil (ghee) separating. Keep stirring it continuously. 4) At this stage add, kasoori methi and ketchup. Mix well and add garam masala. Keep stirring. Cook for 2-3 minutes. 5) Add water and salt. Simmer it on low flame. 6) Add paneer pieces and let it simmer on low flame for 10 minutes. Serve immediately with tandoori rotis or rice!!! Previous Post: Mango Pickle – Gujarati khaatu Methiyu/Methia Athanu!!! After so long ah? I read through what held you back from blogging but that's ok. Sometimes there are other more important priorities which we can't neglect. I have been so good so far, I mean able to find the time but next work work is going to mount up. Really don't know but I guess its about going with the flow. Lovely vegetarian curry with all the flavors I adore. I don't know how to make paneer, anyway never really tried. We use the ready made ones but the taste is hopeless. For us, its tofu compared to paneer. Will try with that for the same divine taste. Even when i had a little time to blog, i didn't have mind space for that. Try it out, it sure is stunner…Sure to impress your guests!! My all time favourite.. Delicious paneer butter masala.. Love to have it with butter naan.. Yes, butter naan will be great with it. I love curries! This looks super delicious. I just ate, but this is still making me hungry! Nice to have you back. Quick Paneer Butter masala looks good. Very spciy luking and delicious paneer..i love this. Thanks Maha!! It gets the colour from tomato ketchup!! Mouthwatering Paneer dish. Love the color. YooHooo! You are back. You are back! 😀 Read that other post. You did have your hands full 🙂 And hey, hope you are in better health now. We were on a vacation and fell ill, very conveniently, one after the other. Getting better now! That Paneer butter masala sure looks yum. Love the colour and consistency of the gravy. Kasoori Methi, Huh…I once bought kasoori methi to try something out and used it just for that. By the time I fished it out of some dark and suspicious corner in the kitchen cupboard later, it was wayyy past its prime 😉 Now I will have to get another one! But once again i missed the event 🙁 i had the pictures clicked but my damn mouse died and i couldn't work much on comp hence didn't send it. It was an onion pic BTW.. I recently discovered kasoori methi and i m glad i did, coz i love its flavor. i use it in curries, tikkas and even in breads!! Wow…this is superb…love your recipe.